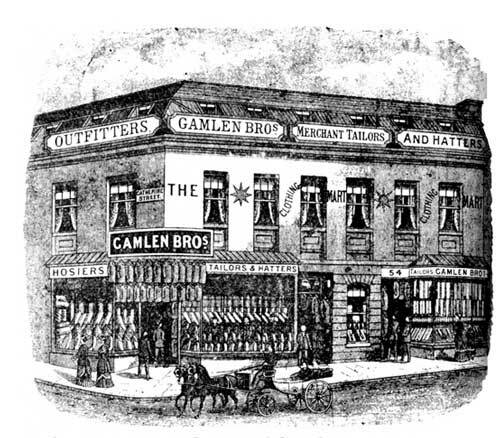 Gamlen Brothers, Outfitters, Fore Street. An 1893 sketch of Gamlen Bros, located on the corners of Fore Street and Catherine Street. 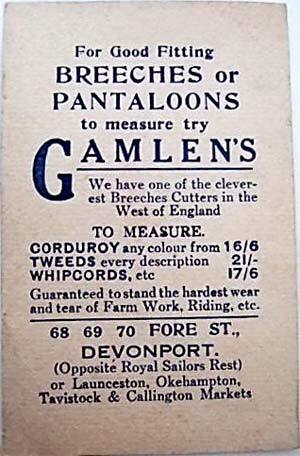 Gamlen Brothers began operating in 1866; they sold clothes, both tailor-made and ready-made, from 53 Fore Street Devonport. According to Industrial Great Britain  one of the brothers left the partnership almost immediately; thereafter the company was run by Albert F Gamlen. Four years after the business started Gamlen were operating from numbers 52, 53 and 54 Fore Street, as indicated by the 1871 census. The census decribes Albert F Gamlen as aged 32, his wife Annie as 29 and his daughter (Florence?) at 17 months. 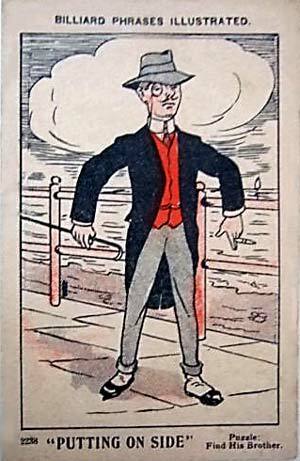 Albert's occupation was given as 'Clothier. The Gamlen household had a servant, Elizabeth Scoble aged 18, and a nurse, Mary Ann Haddy aged 15 (probably looking after the new baby). 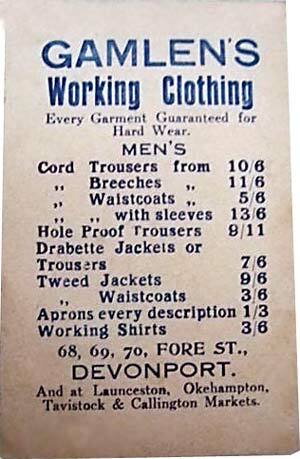 By 1873 the company is shown in the Three Towns Directory for Plymouth, Devonport and Stonehouse, as 'Gamlen Brothers, Tailors and Clothiers, 53 and 54 Fore Street. 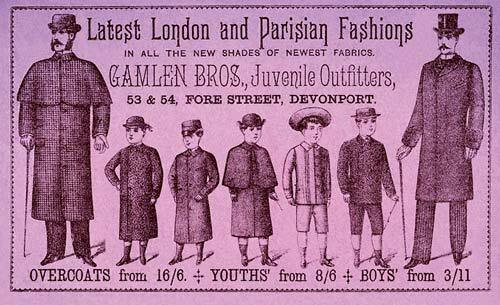 Gamlen Bros is described as 'Clothiers, etc' in the Plymouth, Devonport and Stonehouse Directory of 1888, trading at 53 and 54 Fore Street. “Tis not in mortals to command success,” but if an enterprising spirit, wide experience, energetic administration, and practical acquaintance with every detail of a colossal business successfully carried on for upwards of a quarter of a century, are to count for anything, Mr. A.F. Gamlen may truly be said to have deserved it. Established as far back as 1866, the business originally belonged to the present proprietor and his brother, who, however, withdrawing from the concern nine months afterwards to start elsewhere on his own account, Mr. A.F. Gamlen took over the entire control of the premises, where he has traded ever since under the original style and title of Gamlen Bros. The business, though first started at No 53, under his skilful management so rapidly increased that, in order to successfully cope with it, the incorporation of No 54 became essential, since which event the trade has been steadily progressive, securing public favour and commercial estimation. The premises, eligibly situated at the junction of Catherine Street with Fore Street, occupy a prominent position as a depot for the supply of goods of the best quality. The whole building standing three stories high, is provided a tht ebase with four spacious show-windows, offering the best facilities for displaying a large and varied stock of fashionable suiting,s “ready-mades” of all kinds for gentlemen, men’s, youths’, and boys’ suits, and juvenile wear of every description and of excellent quality; hats of choice quality and latest fashion, caps, collars, gloves, ties, white and coloured shirts, a large assortment of braces, including te firm’s speciality, the “Sampson,” guaranteed to stand a strain of 150lbs., and handkerchiefs in every possible make and value, all arranged in the most attractive manner, and exercising a seductive influence upon the spectator. The interior is a well-stocked establishment comprising four spacious rooms, and the various departments in connection therewith are men’s “ready-made,” “mechanic and artisan,” “hosiery,” “hat and cap,” and an “odd and end” department. There is also a department for the bespoke trade, which is well patronised, although the bulk of the business done is in the ready-made department. Mr Gamlen intends taking in as partner his son Jackson Taylor, who has recently returned from London, where he has been gaining practical experience in the wholesale and retail clothing trade. All the bespoke work is executed on the premises, and by thoroughly capable workmen, under the active superintendence of the proprietor, complete satisfaction being thereby assured. 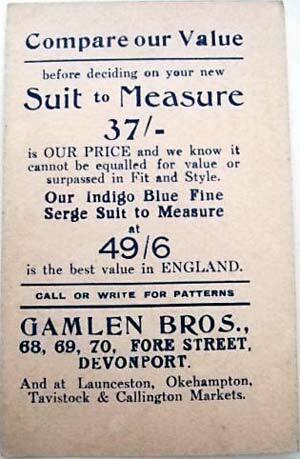 Mr Gamlen was privileged in the supplying and making of sailor suits for H.R.H. the Duke of Connaught, a fact bearing pointed testimony to the wide-spread character of his business reputation. His trade is a ready-money one, and is also wholesale and retail. It is widely distributed in Devon and Cornwall, while the amount of export trade done with Ireland in connection with the coastguard there, is considerably in excess of that of any other shop in the trade. Clothes are only made on the premises when ordered, and the goods thus supplied have given the greatest satisfaction to a large and ever increasing number of patrons. A large staff of assistants are employed in the various branches of the ready-made department, their unfailing courtesy to every clas of customer forming a very pleasing feature of this deservedly popular business establishment. There are extensive stores at the back of the premises, and goods are delivered throughout the Three Towns free of charge. Constant solicitude for his patrons’ convenience is a prominent feature of Mr. Gamlen’s management, and to this is undoubtedly due those indications of augmented success which the visitor can hardly fail to observe. End of Article. 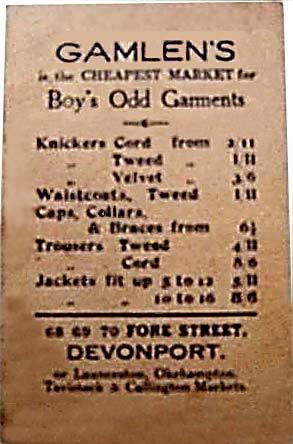 Devonport residents were able to purchase the latest London and Parisian fashions, as per this 1890s advertisement. On 23 September 1896, Queen Victoria became the longest-reigning monarch in British history. 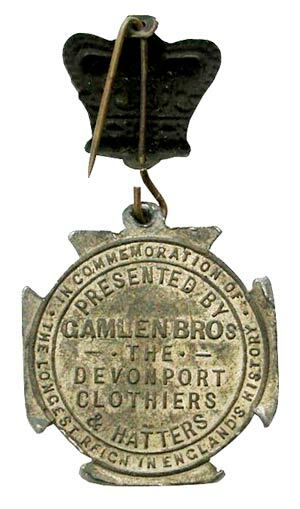 At the Queen's request celebrations were delayed until 1897, to coincide with her Diamond Jubilee.. Gamlen Bros joined in the national celebrations with the production of a company medal. Gamlen Bros Queen Victoria celebration medal. 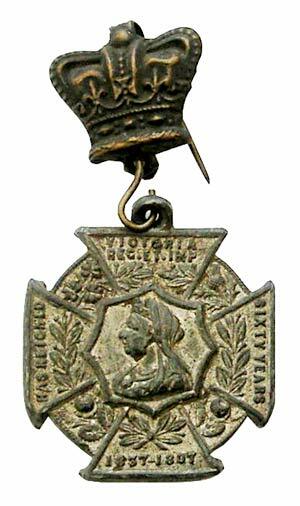 Although Queen Victoria became longest reigning monarch in 1896, in accordance with everyone else in the nation Gamlen Bros used the Jubilee year of 1897 for production of their medal. Gamlen Brothers, Tailors, were still in business in 1923 and, according to the directory this year was trading only from 69 and 70 Fore Street. The last known reference to Gamlen Brothers, Clothiers and Outfitters, 69 Fore Street, was in 1930 . the company's telephone number was given as 333. 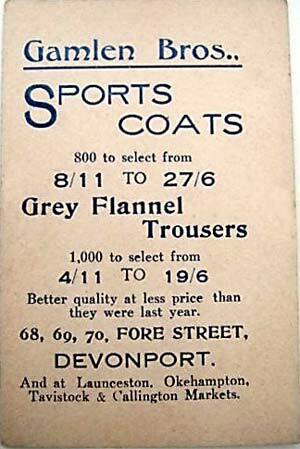 Around 1930 Gamlen Bros produced this set of advertising trade cards, indicating company stores at 68, 69 and 70 Fore Street Devonport, Launceston, Okehampton, and Tavistock & Callington markets. 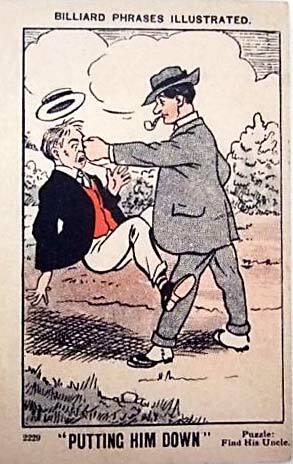 On the front of each card is a humorous image and Billiard Phrase; the two examples shown here are 'Putting Him Down' and 'Putting on Side'.